First Minister Nicola Sturgeon chaired a summit in Edinburgh on Scotland’s response to the unfolding humanitarian tragedy in southern Europe. 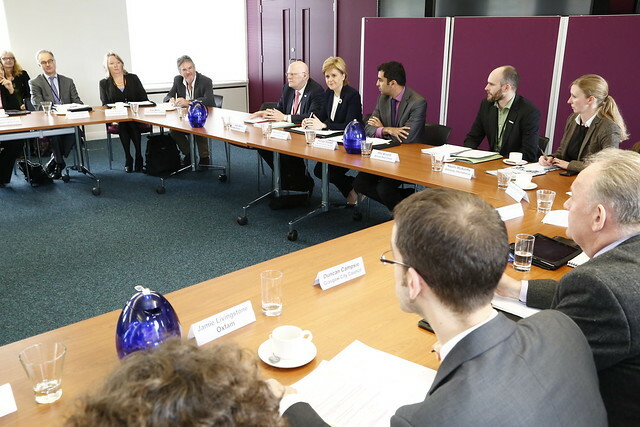 The First Minister brought together representatives from the refugee community, third sector, local authorities, religious and political leaders, and other representatives of civic Scotland, to discuss the crisis and set out what Scotland can do to help. Ms Sturgeon then heard first-hand accounts of fleeing conflict and persecution from the refugee community. After the summit, the First Minister announced that an operational task force would be set up to examine capacity in a range of services in Scotland, including housing, health and social services. The task force will also play an important role in bringing together the many expressions of goodwill and offers of help from communities across Scotland. An initial #1 million to support the taskforce will be made available. On September 3, the First Minister wrote to the Prime Minister urging him to sign up to the EU proposals on relocation and refugee resettlement and allow the UK to take its fair share of people fleeing persecution and conflict. You can read the letter here.